Timeless. The Sicilian Cologne home fragrance opens with a very appealing scent of crisp Citrus combined with sparkling Bergamot, bright Lemon, Citrus Tree and refined Tea Leaves, soothed with Jasmine and Neroli on a sophisticated Vetyver and Patchouli. Discreetly silk-screen printed, sleekly encased in a glass vessel tinted in a beautifullight grey color, the Sicilian Cologne room spray is a contemporary interpretation of an elegant Cologne. Timeless. The Sicilian Cologne home fragrance opens with a very appealing scent of crisp Citrus combined with sparkling Bergamot, bright Lemon, Citrus Tree and refined Leaves Tea top notes, soothed with Jasmine and Neroli on a sophisticated Vetyver and Patchouli undertone. 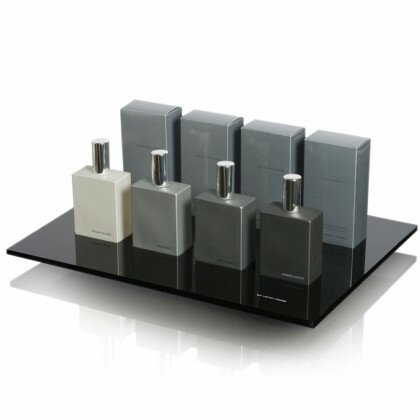 A contemporary interpretation of an elegant Cologne.